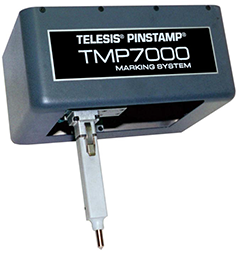 The PINSTAMP® TMP7000/470/600 is a robust single pin marker targeted at applications requiring extremely deep penetration marking. 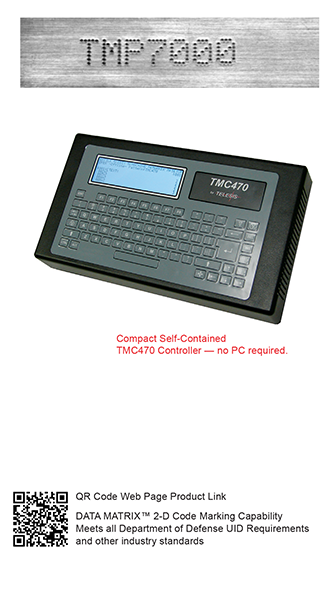 Its 4” x 6” (100mm x 150mm) marking window is ample for a wide range of applications and its TMC470 controller allows it to be easily integrated into most automated applications. "We recommend TELESIS hardware to our clients because we believe it is the best marking equipment available. The success of our software business depends on high quality 2D Data MatrixTM dot peen marks and TELESIS consistently delivers quality marks – every day – every time!" Chuck Stewart, Stewart Technologies Inc.